Page created: 2-May-2007, updated: 9-Jun-2007, 19-Jun-2007, 26-Jun-2007, 18-Jul-2007, 27-Jul-2007, 15-Aug-2007, 21-Aug-2007, 24-Aug-2007, 30-Aug-2007, 4-Sep-2007, 7-Sep-2007. The B07 HFCC/ASBU Conference was held at the Hilton Metropole NEC Hotel in Birmingham, UK from 27th – 31st August 2007. The Hilton Metropole Hotel is adjacent to Birmingham International airport (BHX) and Birmingham International train station at the NEC. The Conference will take place in the Library room at the hotel. For more information, please visit the page of the hotel and additional information on meals and parking in the hotel. Please complete the hotel booking form and send it to the Hilton Metropole NEC by Friday 13th July 2007. Form for travel details - Please submit in addition to the registration form! Updated list of confirmed hotel bookings and conference registrations as of 30 August. The Conference Fee is GBP £70. It will be collected in cash by the HFCC Conference Secretariat during registration on Sunday 26th and Monday 27th August 2007. It is most beneficial for delegates to fly into BHX. An interactive destination map can be found on the website of the airport. If delegates prefer to fly to London, it is recommended to use public transportation to travel from London airports (LHR or LGW) to Birmingham International. Coach information can be found at National Express site and train timetables and fares can be found on the the Trainline web. There are no domestic flights between any London airports and Birmingham International. The Hilton Metropole NEC Hotel operates a complimentary shuttle bus service between Birmingham International airport, train station and the hotel. The hotel is approximately ten minutes’ walking distance from the airport. Frequent trains to the centre of Birmingham take 10-20 minutes. A number of delegates may require a visa for entry into the UK. Official information can be found on the UKvisas website. Delegates should make their application as early as possible to allow for any delays in processing time. Certain visas may be obtained online; others may be obtained through a British Embassy. Christian Vision will be happy to provide a letter of invitation in order to assist delegates with visa applications. Please email Hfccb07 yahoo.co.uk to make your request for such a letter known. Birmingham is the UK’s second city and is situated in the heart of England. Visitors are offered world-class shopping, entertainment and dining experiences. Birmingham provides easy access to several tourist attractions across central England. More information can be found on the Visit Birmingham website. UK electricity is 240V and uses a 3-pin rectangular plug, type G (see World Electric Power Guide); delegates should bring an adaptor where necessary. The currency of UK is Sterling, with units of Pounds and Pence. Monday 27th August is a public holiday in UK: banks, public offices and some shops will be closed; public transport links will run a limited service. UK weather in late August is usually warm (by British standards) but rain is possible at any time! On 1st July 2007 a smoking ban comes into force, banning smoking from all public areas including hotel lobbies, airports, transport systems, restaurants and bars. 2Mbps internet connection will be available in the main HFCC/ASBU meeting room of the Hilton Metropole NEC. Delegates should cover the cost of personal internet connection where appropriate. 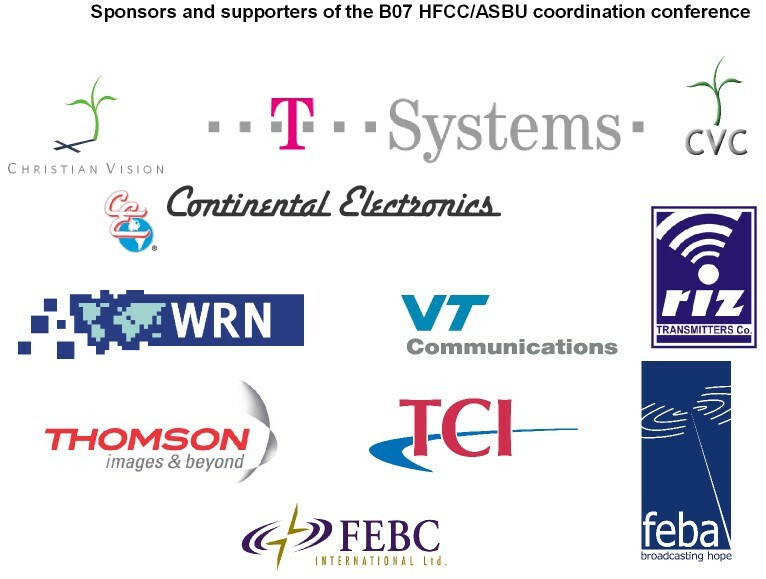 The B07 HFCC/ASBU Conference is hosted by Christian Vision, in association with T-Systems Media & Broadcast. Please visit this page later for more information.